SETH’S PICK :: EDGE OF SPIDER-VERSE #2: When was the last time any of you saw somebody cosplay as a character who hasn’t even appeared in a published comic? I didn’t think that was even possible until now. Over the past few months I’ve seen more and more pictures of cosplayers bringing Gwen Stacy: Spider-Woman to life. That character debuts in this week’s Edge of Spider-verse #2. So why have so many fans taken to this character so quickly? 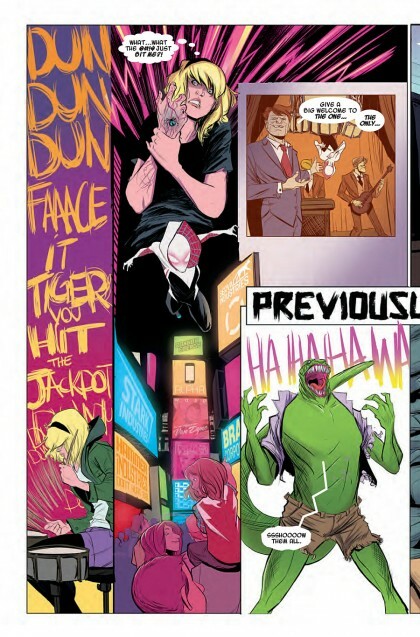 I’m sure writer Jason Latour’s twist of putting Gwen in the Spidey outfit has something to do with it. People still love Gwen, and the thought of seeing her as a hero and not a victim is a good thing for comics. While Latour does provide some clever narrative skill in this issue, I think the bigger reason so many fans are looking forward to this issue is the brilliant design work of Robbi Rodriguez. Something obviously clicked in Robbi’s design and fans immediately responded, with cosplayers appearing as the character at multiple conventions around the country. I’d be remiss to not mention that my Heroes cohort Rico Renzi provides the fine color art in this issue. Rico and Robbi are frequent collaborators, and if you’ve seen their work on Vertigo’s FBP, you know they complement each other quite well. I’ve been fortunate to see the finished product, and all three guys should take a bow for crafting a wonderful single issue of comics. Don’t be at all surprised if we don’t see a Gwen Stacy: Spider-woman series after the inevitable success of this issue.